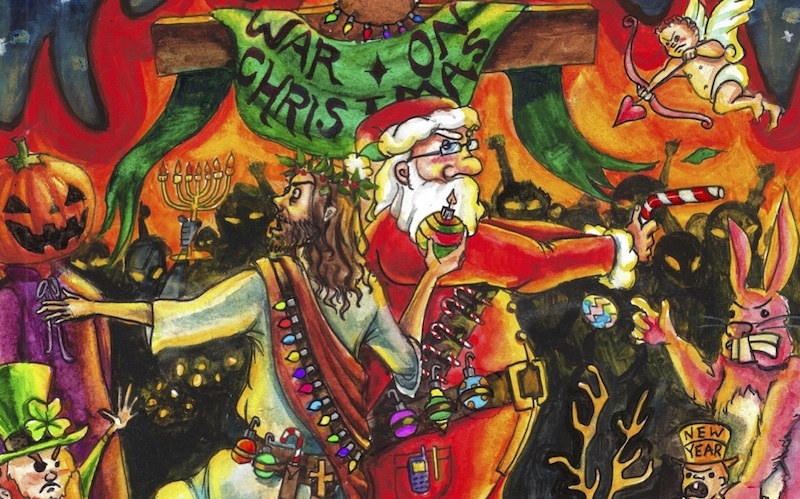 This article originally appeared in the War on Christmas Issue. SHAWNEE, OK—Get ready, because this story is about to warm your heart more than any mug of hot cocoa could. Meet Joseph Cramble. To most people, he might seem like an ordinary electrician, but to the residents of Shawnee, Oklahoma, Cramble is a hometown hero who repaired the local Save-a-Lot’s neon holiday signage to put the “Chma” back in “Christmas”! Responding to a call late Monday night, Cramble was seen courageously testing fate on a wobbly ladder, all to bring back the true meaning of the holiday season for his fellow Shawneeans. With just a pinch of smarts, a dash of technical skill, and a whole lot of Christmas spirit, Cramble transformed a flickering “Merry rist s!” into a bright beacon of winter cheer. Faith in electricity restored! Reverend Peter Prendergast echoed Pinley’s praise. “Simply put, without ‘Chma,’ there is no Christmas. Same goes for ‘stm,’ ‘h,’ and, incidentally, ‘Christ.’” The ceremony ended with a touching sentiment from Mayor Pinley’s 7-year-old son, Billy. “When Mr. Cramble soldered together those wires, I think he soldered his way into all of our hearts.” Does it get any sweeter than that? Though he’s an electrician, Joe doesn’t care much for the limelight. As he said to reporters, “I’m no hero. I’m just an electrician doing my job. Seriously, I was paid to do this.” Sounds like we could all learn a lesson from Joseph Cramble about humility, selflessness, and the effects of falling icicles on exposed wiring this holiday season!